This course provides guidance for the planning of active solar energy systems to preheat domestic and service water. The systems treated by this publication are liquid based. Guidelines apply to the larger commercial-scale applications that require an effort on the part of the designer, as opposed to residential-sized "packaged" systems, which in the past have been available from a number of manufacturers. The concepts developed in this document are targeted for new construction, although most are also appropriate for retrofit applications. Learn to evaluate the feasibility of designing and installing an active solar preheat system using the Solar Payback screening tool developed by the Construction Engineering Research Laboratory (CERL). Learn about closed-loop solar energy system. Learn the fundamental components of the solar loop in a closed loop solar energy system. Learn about piping and component corrosion and maintenance issues that are a common cause of closed-loop system failure. Learn about the direct circulation system for solar energy water heating. Learn about freezing issues in direct circulation systems. Learn about site location, freezing days, estimated load size and water quality issues in system selection. Learn about system layout at the planning level. This course is intended for mechanical engineers and other infrastructure design and construction professionals who want an introduction to planning solar water heating systems for buildings and related facilities. This course will introduce you to basic considerations when planning solar water heating systems. 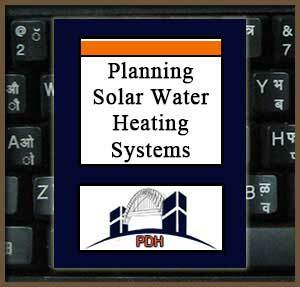 Upon completion of this course you will have an understanding of guidelines and approaches to planning of solar water heating systems.